This is an annular eclipse of the sun, visible as such from north-eastern Canada, western Greenland, the Arctic in the vicinity of the North Pole, and in north-eastern Siberia. The partial phase of the eclipse will be visible from the entire UK; the further north you are, the deeper the eclipse. For example, in Kent, 30% of the sun is hidden; in Derby, 36%; Liverpool, 38% and Perth, 44%. In the far north of Scotland, the magnitude of the eclipse is just over 50%. As in 2011, the moon’s umbra misses the earth completely; the deepest partial eclipse taking place in northern Siberia. The magnitude of partiality in Cornwall is 16%, increasing as one goes further north and east. In London 26% of the sun is covered; in Hull 30%, whilst in Aberdeen almost 34% of the solar disc is covered by the moon. The deepest partial eclipse visible from the UK, with a magnitude of 40%, may be witnessed from the Shetland Islands, where first contact takes place a few seconds after 09h00. Second contact, when the moon leaves the sun’s disc, is due to take place at 10h 56. In this total eclipse of the sun, the moon’s shadow first hits the earth in the central Pacific Ocean. It then crosses Mexico, the eastern United States and Newfoundland, leaving the earth at sunset in the eastern Atlantic Ocean, several hundred miles west of the Iberian Peninsular. Only Scotland and Northern Ireland will see the start of this eclipse, at sunset. Yet another partial eclipse with no place on earth seeing totality; the deepest partial phase of 92% being visible from north-eastern Canada. As far as we are concerned, Northern Ireland will see the best of this eclipse, when from the northern coast of Ulster, 55% of the sun is hidden. First contact is at 10h 02, maximum eclipse occurring at 11h 01, and the eclipse ends at 12h 03. In Southend the magnitude of the eclipse is 41%. This is destined to be Britain’s best partial eclipse since that of 2015, March 20. The deepest eclipse will be seen from the southwest of Ireland, where at 18h 13, 98% of the sun’s disc will be hidden by the moon. At Land’s End the eclipse begins at 17h19 and ends at 19h10, the maximum magnitude being 96%, which occurs at 18h16. From everywhere in the UK, 90% or more of the sun’s disc will be covered by the moon on this occasion. The path of totality runs from northern Siberia, across the Arctic Ocean, curving southwards through eastern Greenland, and touching the western coast of Iceland. Reykjavik lies just inside the path of the moon’s shadow, and experiences totality lasting for 1minute and five seconds. The shadow continues southwards, passing just 152 miles to the east of Ireland to hit the north coast of Spain towards sunset. Madrid lies just to the south of the shadow, but Leon, Zaragoza, Valencia, Bilbao and Taragona lie within it.The eclipse ends just to the east of Majorca. A total eclipse with a central line starting at sunrise in the mid Atlantic Ocean, passing through Gibraltar and Tangier; along North Africa, crossing Egypt and the Red Sea; proceeding southwest Saudi Arabia and the ‘Horn of Africa’, to end at sunset in the Indian Ocean, south of Sumatra. From our point of view, a partial eclipse of 25% is visible from the Shetland Islands, increasing to 54% on the south coast of England. The eclipse begins around 08h00 and finishes about 10h00. An annular eclipse starting in the Pacific Ocean, crossing northern Brazil, the Atlantic Ocean, and ending at sunset on the eastern coast of Spain. In the UK, southwest Wales and Devon and Cornwall will have the best view of this eclipse at sunset. In St David’s and Pembroke, 62% of the sun is hidden, increasing to 67% south of Torquay. Although the rest of the country will see the beginning of the eclipse, the sun will set, unfortunately, before maximum partiality is reached. An odd little number, this! Most of us miss out, but the Orkney and Shetland Islands will see 30% of the sun covered as the sun rises this morning. Everyone else in the UK can stay in bed. An annular eclipse beginning in the Sahara Desert at sunrise. The path of annularity crosses the Mediterranean and the Black Sea; curves across Asia, and on into the Pacific Ocean via Japan. The partial phase, visible from Britain favours the southeast, where at Dover at 05h20, 60% of the sun is covered. In Kent, first contact is at 04h24, and the eclipse ends at 06h22. The magnitude of the eclipse in Sheffield is 55%; in Dundee 51%, and on the Isle of Lewes, 48%. Another feeble eclipse which may just be seen as it starts, from Scotland, northwest England and Ireland. If you are very rich, book a flight to Alaska to observe totality. If you really want to see this one, and you live in the vicinity of Dover, project the sun’s image at 10h20m26s, and you will see just 0.5% of the sun’s disc covered by the moon. A good evening eclipse for the UK. Observers in the Shetlands will see a partial eclipse of 75%; in Bradford 69%; whilst in Exeter 65% of the Sun's northern limb will be eclipsed. The maximum magnitude of this eclipse increases as one goes from southwest to northeast across the British Isles. Just before 09:00, Penzance will see 53% of the Sun's north-eastern limb covered, whilst the magnitude al Wick will be 63%. At maximum partiality, the Sun is low in the southeast. The eclipse ends al 10:30, having started just before sunrise. A small partial eclipse. Nowhere in Britain does the magnitude exceed the 13% achieved on the southeast coast of Kent. 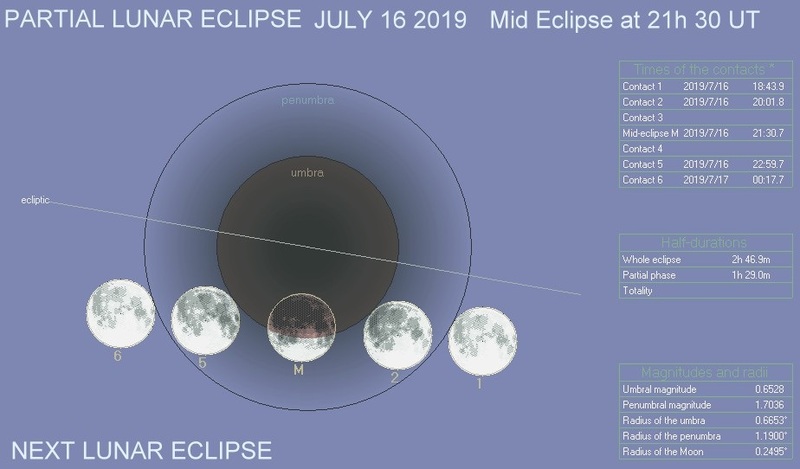 Stoke-on-Trent will see the Moon covering less than 9% of the south-western solar limb, whilst Armagh sees a small notch of 5% The annular eclipse may be seen from the West Indies, the Atlantic and West Africa, finishing in southwest Egypt at sunset. 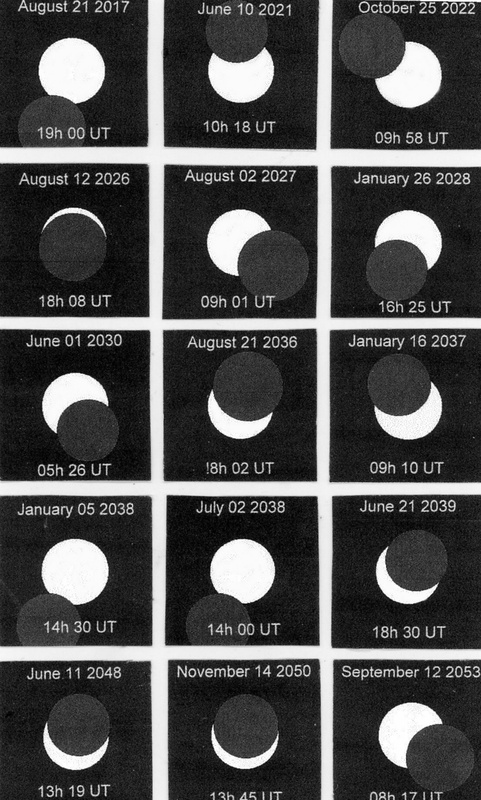 The next annular eclipse is almost a repeat of the one six months earlier, the path of annularity being almost a mirror image about the equator. The partial phase visible from Britain is also similar, but the extreme north of Scotland misses out. The magnitude at Portree on Skye is 3% at the southeastern limb. Manchester's is 12%, rising lo 22% at Land's End. Another annular eclipse, but this time the path passes nearer home. Starting in the north Pacific and crossing Alaska, the northern islands of Canada, it passes over Greenland, through Scandinavia, and ends at sunset several hundred miles west of Moscow. In the UK, the north-eastern portion of the Sun is hidden, the far northeast getting the best view. The magnitude in Shetland is 84%, whilst in Ripon it is 75%, in Cardiff 70%. The extreme southwest of England will see an eclipse of 66%. The path of annularity crosses Iceland and the northern Faeroes. The southern limit passes just 85 km north of Shetland. The path continues into Scandinavia, and the eclipse ends in southern central Asia at sunset. At Lerwick the magnitude will he 90%, falling to 80% in Glasgow, 75% at Sheffield and 70% al Reading. The Moon's shadow passes just north of the earth in the early afternoon. The magnitude of the eclipse in southern England will he 80%: in the Midlands 82% and increasing to 85% or above in northern Scotland. To finish off, this total eclipse starts in the Atlantic, the Moon's shadow touching Gibraltar, crossing Egypt and Saudi Arabia, and leaving the Earth at sunset in Sumatra. The eclipse begins at around 07:11 for most of the UK and finishes around 09:15. The magnitude in the south west is around 59%; in Northern Ireland under 50%, and reducing to under 40% in the far north of the country. This is part of an article I produced for The Society for Popular Astronomy in 2003, to mark the Society's Golden Jubilee. At that time I was the Director of the Occultation Section, and included this as eclipses are special examples of an occultation, where a dark body occults (hides) a bright one. The Moon, in a solar eclipse, is trying to 'hide' the Sun! Interestingly, it is by measuring the light drop, and the time interval seen in nearby stars that the presence of earth like planets has been obtained. The minute drop in light intensity occurs as the planet crosses the disc of the star.